Boucheron has launched Quatre En Rose, a new flanker to 2015's Quatre. Quatre En Rose is styled as a more "casual" / daytime fruity floriental interpretation of the original, with davana, cassis, mandarin, rose, jasmine, peach blossom, patchouli, vetiver and musk. It was developed by perfumer Quentin Bisch. 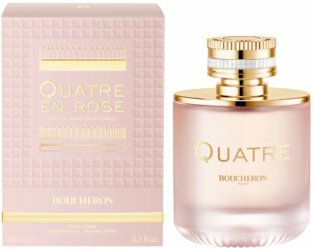 Boucheron Quatre En Rose available in 30, 50 and 100 ml Eau de Parfum. Dear Lord, please make this horrible, gasping, dying shade of yucky-stucco-pink go away! I fear you will have a long wait!